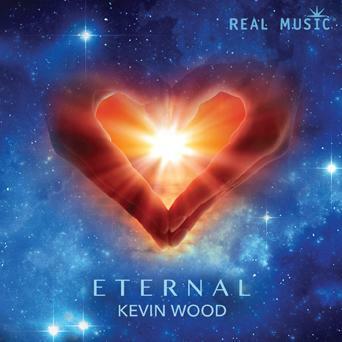 With so many submissions always calling for my attention here at Ambient Visions I’m never sure what to expect when I put a CD in the player or cue up some songs in my media player but I must admit that the music on Kevin Wood’s latest album called Eternal was a pleasant surprise. Sometimes it is an occupational hazard that I inadvertently look at a title and an artist and think that I know what I will find when I listen to their latest album but sometimes that is just not the case. Eternal is a contemplative album from beginning to end and is oriented around offering a peaceful place for the listener to open up to their own inner spiritual journey and to examine it in an environment that is both comforting and safe. Spirituality is a very personal journey that no one can show you the way you need to go but music such as what you will find on Eternal offers you a framework from which to venture into those unexplored waters with a sense that you have company that understands you as you walk on. Eternal is a mixture of sacred and tribal chants, light beats and a touch of classical instrumentation at times and it all works together to create music that reaches into your spirit and gives you permission to “feel” what is oftentimes kept hidden in a world that tends to be a bit too cold to understand the tenderness that exists within each of us at a spiritual level. The music of Eternal offers a calming way to end your day or even to start it for that matter. The chants were skillfully woven into the fabric of this album along with the instrumentation to create a sound palette that will brightly shine into the hearts of those who are prepared to see that which lies within. The cello stands out in several spots during the course of this album and it is always a welcome instrument whenever I hear it interacting with the soundscape in such a wonderful way. Kevin has achieved an intimacy with Eternal that listeners will appreciate as they look within but he has also allowed the music to be more than that. With the many voices that he has mixed into this project and the instrumentation he has given it a spaciousness that speaks not just to a certain spectrum of listener but will appeal to a broader range of people as they see within the music aspects that might not have been there if Kevin had gone a different direction with his compositions or if he had done it all himself. All in all Kevin’s Eternal offers a diversity of views in terms of spirituality but all brought together in an organic way that binds them together as a unified whole. The music is polished and thoughtful in its presentation and will offer the listener a wonderful hour spent contemplating the path they are on and allowing them to see it from a variety of angles. With chants from traditions as varied as African, Native American, Celtic, Indian and Gregorian you can see how it will appeal to a wide cross section of listeners. I’m thinking that this is an album you might want to add to your collection. Recommended by Ambient Visions.